We all have things that are trying to hold us back: guilt from past mistakes, temptations that we can't seem to overcome, or dysfunctions that have been passed down. It's easy to learn to live with these problems and accept them as who we are. We can all find a reason to live like we're at a disadvantage and become negative and bitter--we came down with an illness, somebody walked out of a relationship, our boss overlooked us. But we have to say, "I'm done making excuses. I'm not going to let the past keep me from moving forward and benefitting from the good things God has in store." It is time to say, "It is finished." In his new book, IT IS FINISHED, Joel Osteen writes that we weren't created to go through life weighed down by addictions, dysfunction, guilt, or the past. God created us to be free. Joel encourages readers to leave behind the negative mindsets, the scarcity mentality, and the limitations others have put on us, and shows us how to step into new levels of victory, new levels of favor. 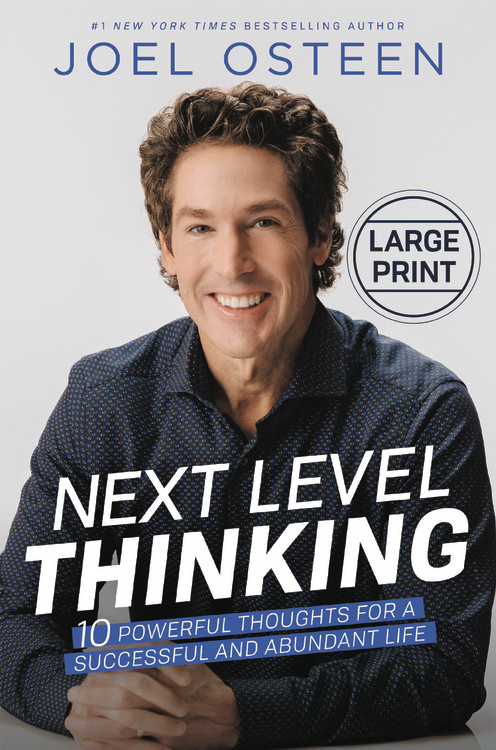 Next Level Thinking: 10 Powerful Thoughts for a Successful and Abundant Life by Osteen, Joel was published by Faithwords in October 2018. The ISBN for Next Level Thinking: 10 Powerful Thoughts for a Successful and Abundant Life is 9781546010524.